Left: "Double throat" bells. Starr Brothers Bell Co. called them "arctic" bells in their 1915 catalog. Middle: "Round ridge" bells with two throats rather than the usual one. Right: Machine stamped "triple throat" bells probably designed by George Tucker. 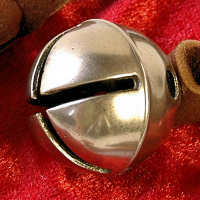 Many sleigh bells have just one throat (slit) across the bell, but the sleigh bell designs shown here have two or even three throats. Most bell designs with multiple throats originated in the late 1800s, when manufacturers were looking for ways to entice shoppers to buy their bells. In some cases, the manufacturer added a second slit to a standard single-throat design. The "egg", "band", and "round ridge" bells shown are examples. 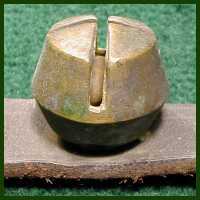 Many, but not all, "acorn" and "patent" bells are double throats. 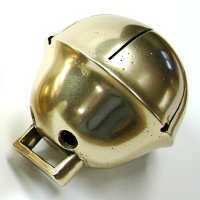 Other multiple-throat bell designs have no single-throat versions. 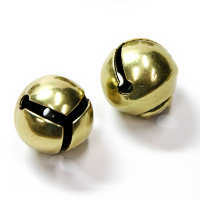 Double throat (arctic) bells, patent or Tucker bells, triple throat bells, and Swedish bells are found only with multiple throats. Left: Machine-stamped "patent" or "Tucker" bells were designed and patented by George Tucker. 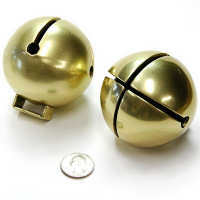 Middle and right: Spherical "egg" bells (middle) and "band" bells (right) normally have one throat, but these examples have two. Bells with multiple throats are distinctive looking. They also sound quite a bit different than the same bell with just a single throat. If in good condition, a single-throat sleigh bell, such as a petal or round-ridge bell, will usually have a bright, loud sound somewhat similar to the pure ring of an open (liberty) bell. If a second throat is added to that same sleigh bell, the sound becomes decidedly softer and changes to more of a "chiming" tone. The throats are made in several ways. 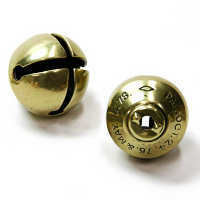 Throats in machine-stamped bells are usually created when the flat metal blanks are stamped out; these flat blanks are molded into spherical bells using high-pressure forming machinery. Throats in sand-cast bells can be created during the casting process or they can be cut by a saw after the bell is cast. Some cast bells have one cast and one sawn throat. 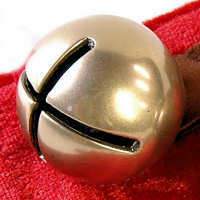 Many of the bells shown are also discussed in other articles in the "Sleigh bell designs" section of this website. Learn more about: Petal bells, round ridge bells, Swedish bells, patent/Tucker bells, egg bells, and band bells. 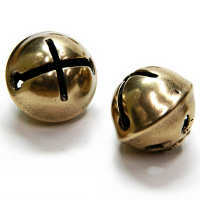 Left: "Swedish" bells are a type of triple-throat bell made of heavy cast-brass or bronze. Their three throats were cut after the bells were cast. Center: "Improved Swedish" bells have two throats formed during the stamping process. 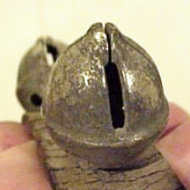 Right: One throat of an acorn bell was partly formed when the bell was cast and the rest of this throat and the entire second throat was cut later.